When a woman becomes pregnant, it comes with many questions and potential challenges. However, if you are going for a new job the big question is, when interviewing, should you mention it and if so, when? Firstly, the Equality Acts 2004, are there to protect you and you are not obliged to inform a potential employer unless the job would require you to conduct work that could harm your baby or for film and media/modeling positions primarily. Therefore, it is up to you to decide if and when you divulge your exciting news. My advice to people is if you do not look pregnant, then I would not mention it until after you accept an offer of employment. That way you will guarantee that your pregnancy did not hinder your employment chances. Although employers are not legally permitted to discriminate on the grounds of pregnancy, they can still overlook your application and think of other reasons as an excuse for not pursuing your application. Many employers still discriminate against pregnant women but do so under the radar and so are not penalized for their behaviour. 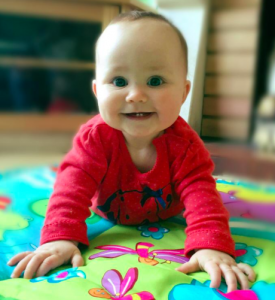 The reasons for their doing this are the time taken to train and hire someone needs to be repeated when you are on maternity leave. This becomes a cost to the business over an employee who will stay working continually. If you are heavily pregnant, it will be difficult to hide so it would be worth mentioning. Most people choose not to change jobs during the latter stages of their pregnancy so it is a rare occurrence. If the role is short term, then you could mention it so as to assure the employer that you can complete the contract prior to your maternity leave. You may choose not to take a long maternity leave as you would rather work, so if this is the case, you could mention this in the interview. Working while pregnant can be challenging for women, and taking on a new role at the same time adds another layer of stress for you. A new employer may not be as tolerant on absences and the fact that you may not have as much energy a s you usually did. Ideally I would recommend waiting until after your maternity leave to move to avoid this. If your current role is stressful and you need to leave, then naturally a move would be in your best interests. For positions where there are a large number of people doing the same role, a pregnancy would not cause any major adjustments for the employer. For positions where there is a long training period and in unique roles, it can be more difficult for an employer to find a replacement who can match your skills during your maternity leave. Take it on a case by case basis and trust your own judgement on the employer to decide which is the best option for you. Written by Gillian Knight, MD of Kala Management Solutions www.kala.ie. For employers, please call 01 619 02 82 for further advice on this area. For job seekers, we focus on helping people write a great CV and perform their best in interviews. 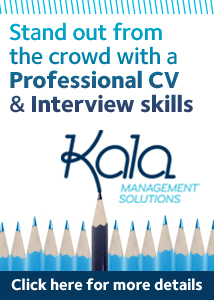 If you would like to book a coaching session or help with your CV or cover letter mail info@kala.ie or go to www.kala.ie/cvwriting for more details.